A volcano spewing clouds of ash has plunged one of the world's top tourist destinations into crisis. The Indonesian island paradise of Bali, which welcomed almost 5 million foreign visitors last year, is struggling to deal with the chaos wrought by Mount Agung in recent days. Officials say as many as 100,000 people need to urgently leave the danger zone around the volcano, which started belching ash on Saturday. The eruptions have prompted the closure of Bali's main airport, leaving more than 50,000 travelers stranded. The disruption is hurting businesses ranging from international airlines to street vendors. Tourism is the biggest industry on Bali, which was ranked as the world's best destination this year by travel site TripAdvisor. Local authorities estimate that as many as 15,000 tourists have already canceled their vacations to Bali as a result of the disruption caused by the volcano over the past three days. Every day Bali's main airport is closed costs the local economy about $18 million, according to Keith Loveard, senior analyst at Jakarta-based Concord Consulting. He expects the island's economy to take a major hit over the traditionally busy Christmas and New Year period as tourists rethink their travel plans. "There's a very strong chance that many would-be tourists will decide to go elsewhere," he warned. Tourism in Bali has suffered in the past. It declined significantly after deadly terrorist attacks In 2002 and 2005, which resulted in "a dramatic drop" in local residents' incomes, according to Loveard. Volcanic activity in the region has also disrupted air travel to the island in previous years. The current turmoil could hamper the Indonesian government's goal of attracting 20 million tourists annually by 2019. Bali makes up more than 40% of all tourist arrivals into the country, according to analysts at Nomura. Mount Agung's eruptions have prompted the evacuation of 30,000 people. Indonesia has been trying to cultivate alternative tourist destinations like nearby Labuan Bajo. 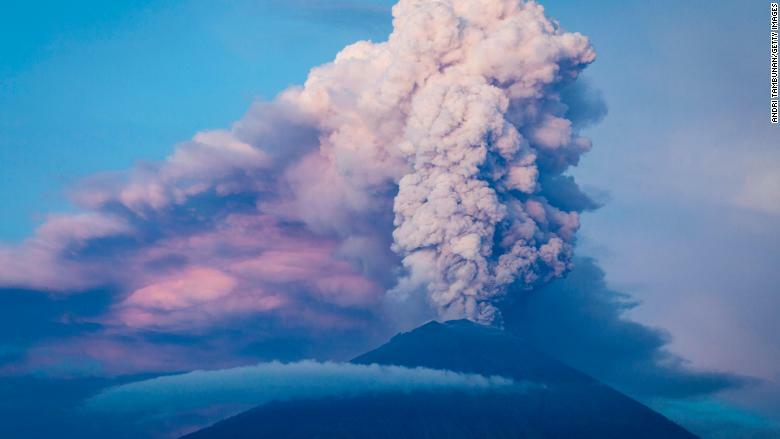 But these could also be affected by Mount Agung's ash clouds and by a prolonged closure of Bali's main airport, which is a hub for other parts of the country, according to Loveard. The crisis is already eating into the profits of airlines across the region. Indonesia's flag carrier Garuda is the most heavily exposed. Corrine Png, an analyst at research firm Crucial Perspective, estimates that Garuda has a 30% share of traffic at Bali's main airport and stands to lose $300,000 for each day that it's closed. The company's shares sank 1.8% on Tuesday. The disruption is costing AirAsia, the Kuala Lumpur-based budget airline, around $250,000 per day, according to Png. Neither Garuda nor AirAsia immediately responded to request for comment on those estimates. "The worst outcome is if Mount Agung continues to spew volcanic ash intermittently for many months," Png said. That would result in repeated closures of the airport and significant numbers of flight cancellations. 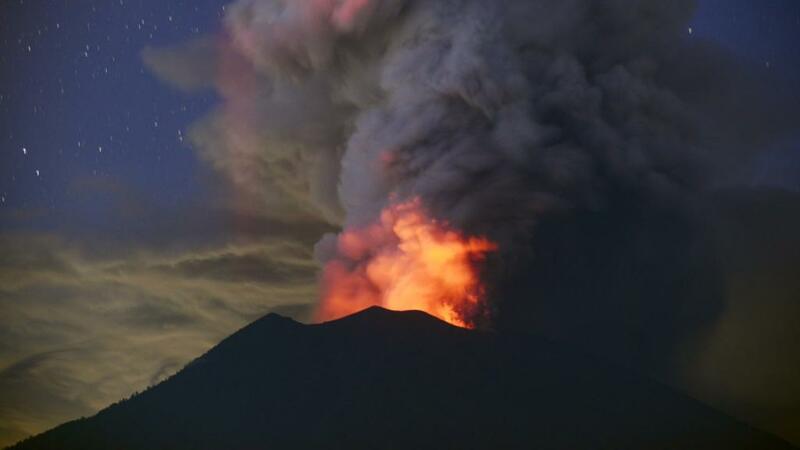 However, the volcano chaos may not have any major implications for the Indonesian economy as a whole. Bali only accounts for 1.5% of the country's total gross domestic product, according to Nomura. Still, President Joko Widodo wants tourism to account for 8% of the Indonesian economy by the end of 2019, up from 4% last year. "Mount Agung could frustrate those ambitions," Loveard said. -- Hendra Brawijaya contributed to this report.